Say goodbye to chilly car rides. 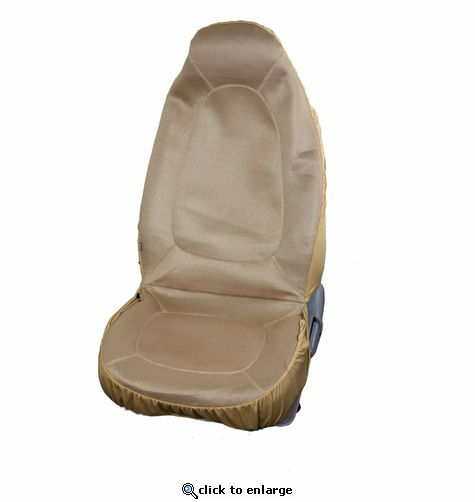 The Heated Single Car Seat Cover provides hours of comfortable heat. The stealthy heating element is strategically positioned at the back rest for continuous soothing warmth. Connect it to your car's 12-volt cigarette plug and you are set to drive for miles! All Over Warmth: Heating panels are placed throughout the back rest and seat of the cover to provide you with complete comfort and coverage in your warmth. Temperature Controller: The include temperature controller gives you the freedom to pinpoint the exact heat level you need to maximize your comfort on the road. With just the click of a button, the color coded LED lights cycle through the 4 heat settings for greater personalization. Consistent Heating: Plug the adapter into your vehicle's cigarette adapter and attach the other end to the heated seat cover. As long as you are on the road, you can feel the luxury of heated seats!